Galfenol is a new class of iron-based, magnetic Fe1-xGax alloy that exhibits giant magnetostriction. It has attracted considerable attention because of its potential for use in mechanical devices where resistance to fracture is an important criterion. Maximum values of the magnetostriction coefficient (3/2λ100) of 400 ppm have been observed in bulk single crystals where x=0.19. T his is more than one order of magnitude higher than that for pure α-Fe. A structurally heterogeneous model has been proposed to explain the enhanced magnetostriction and elastic softening for Fe1−xGaMx alloys. This model assumes that heat treatment produces a structurally and chemically heterogeneous state consisting of coarsening-resistant, nanometer-scale DO3 precipitates in FeGa alloy. Recent neutron diffuse scattering measurements on FeGa alloys confirm that the enhanced magnetostriction is directly related to the presence of an underlying structural heterogeneity. Motivated by a strong interest in understanding the effects of pressure on these materials, Muhtar Ahart (Carnegie) and CDAC Director Russell J. Hemley, along with colleagues from Virginia Tech and the National Institute for Standards and Technology, employed high-pressure x-ray diffraction techniques to investigate the phase behavior of the Fe0.81Ga0.19 alloy at 300 K. Their goal was to study how the addition of Ga affects the pressure-induced bcc-to-hcp phase transition in Fe, how pressure affects the diffuse scattering, and to search for new phases, in order to shed new light on the underlying microscopic mechanism responsible for the giant magnetostriction in the alloy. 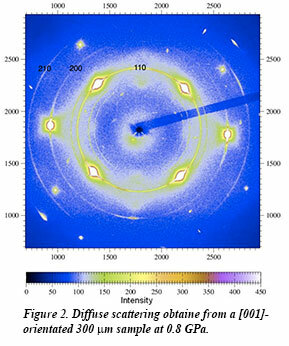 By analogy with the phase transition in pure iron, we proposed a possible mechanism for the transition in which the hcp structure can be derived from the bcc lattice through a compression along the  direction of the bcc lattice, followed by shear along the [1-10] direction. 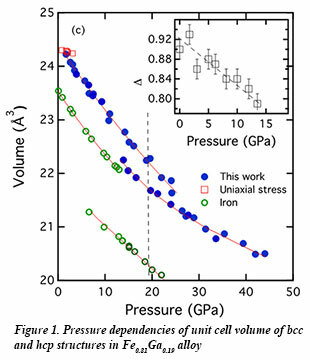 The group speculates that the larger atomic size of Ga is responsible for the higher bcc-to-hcp transition pressure of 18.5 GPa compared to that (13 GPa) for pure iron. They find that a modest uniaxial stress of ∼3 GPa is sufficient to suppress the diffuse scattering, which originates from the presence of DO3 nanoprecipitates [M. Ahart et al., Phys. Rev. B 88, 184102 (2013)].